Knitographical: Our Prime Minister Knits - So What? I'm getting on my political hobby horse. 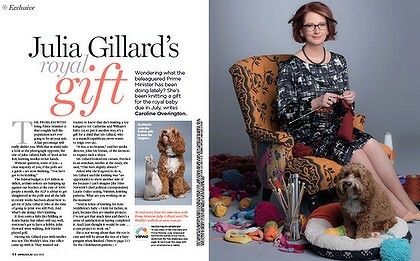 I have been increasingly disgusted at the media treatment today of Julia Gillard the Australian Prime Minister and her decision to do a story for the Australian Women's Weekly that showed her knitting. 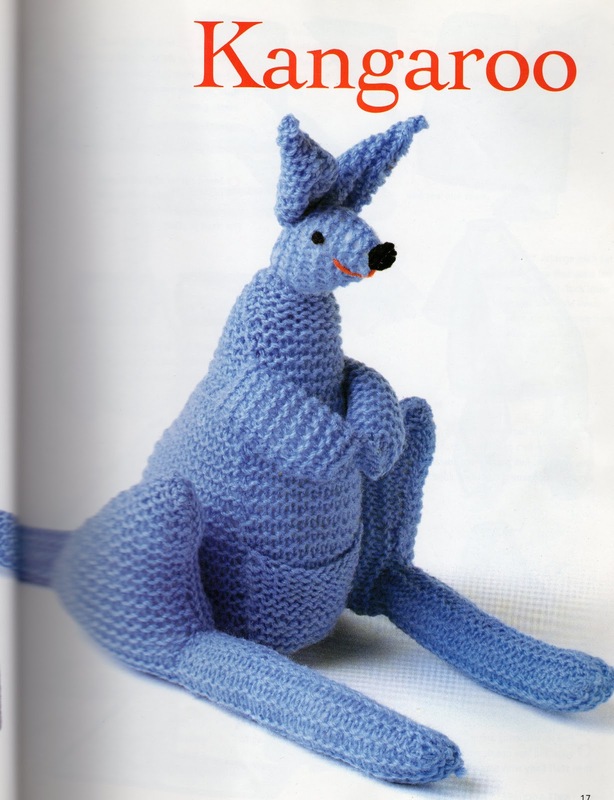 Not only knitting but knitting a toy kangaroo for the new English Royal baby, Will and Kate's soon to be born little heir to the Australian (and English) throne. Apparently according to media and political commentary, it is impossible to be both a feminist and knit. This photo clearly demonstrates Julia's lack of intelligence as "Smart women don't knit!" And apparently deciding to be photographed knitting is tantamount to political suicide. Oh and there is a strong conspiracy theory running that the photo is a giant set up and Julia clearly can't knit as she is holding either her yarn or her needles or both all wrong! According to her political opponents she is clearly Madame Defarge, knitting while (political) heads roll and has lowered the office of Prime Minister to new depths. It makes me cringe at the state of political debate in this country. It makes me despair at the level of esteem in which knitters are held. I wonder what would have been said if a male Prime Minister had been shown knitting? (Strike that, the Australian media would have been questioning his sexuality). As a smart women who knits (Hey, I'm an academic) I feel insulted by implication by the media furor this has kicked up. I can offer evidence that refutes the assertion that Julia was purely stunt knitting. 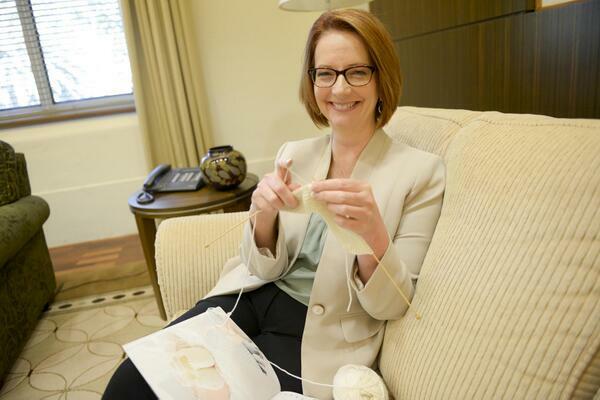 It's not the first time we Aussie knitters have learned that or prime minster likes knitting. On World Wide Knit in Public Day this year Julia tweeted "Happy World Wide Knit in Public Day #WWKIP JG" with a photo of her knitting. She looks happy. What I'm questioning is her choice of knitted item for the royal baby. 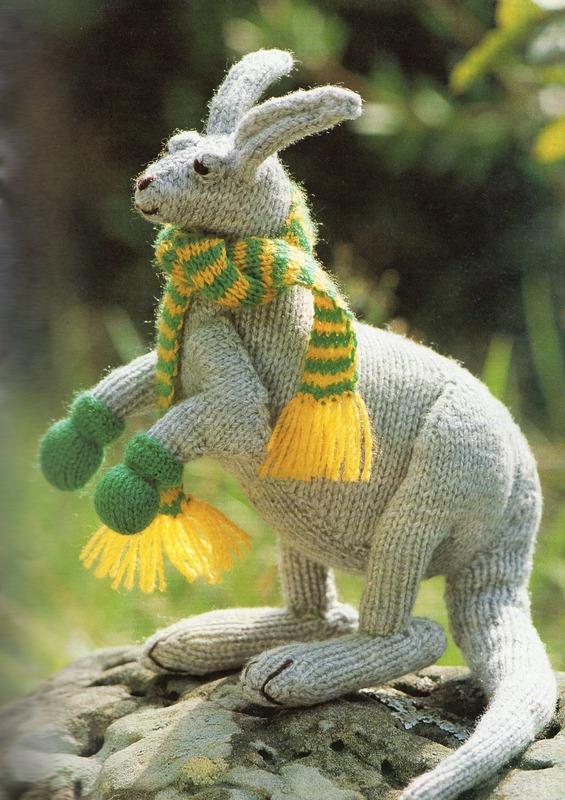 The knitted Kangaroo has to be the creepiest portrayal of an Aussie wildlife icon ever perpetuated. I've given you some examples of the vintage kangaroo and baby joey combo from the 1950s / 1950s. I hope this is not what Julia was knitting. It will give the Royal Baby nightmares. Here's my contributions from my own extensive library of bad toy patterns. Or a really scary blue kangaroo? The construction of this one is kind of cool. It is made from a series of grater stitch squares. So I'm opening it up to you. Let's debate the really important things here. What would you knit for the Kate and Will's new Royal baby? Is there, in fact, such a thing as a cute knitted kangaroo? (I'd love to see evidence). Hi my choice would be a koala which is nice and cute a Kangaroo make me think she is doing it because of what is happening in her life at the moment. I agree with you about the potential cuteness of the knitted koala! Good suggestion. In light of today's political upheaval I'll need to re-title this post - Our Ex-prime minister knits - So What! Clearly Knitting IS political suicide! I think that Julia may have a lot more time to knit in future. Well, it must help her adjust. I know when my life goes crazy I reach for the knitting needles. I live in the UK so I'm not an expert on Australian politics but some of the stuff I've heard lately about comments made to/about Julia Gillard are shocking & so sexist & really doesn't show Australia in a good light. I'm sure most Australians are sensible people though. As for the PM knitting, why is someone knitting such a big deal. It'd make headlines in this country too. It's possible to be an intelligent career woman & knit. So many ignorant people around. Thanks for your comment from the other side of the world. It's somewhat scary that Australian politics gets reported on in the UK for silly things like this. There is a very nasty vein of insults running in what counts for political debate in Australia at the moment. Thankfully we're not all like that. Us knitters especially are sensible people.